Valløby Gamle Præstegaard was builded in 1750. It is situated in Vallø Municipality, which is situated 5 miles south-west of the town Koge (and situated 40 miles south of Copenhagen). It is the rendezvous of the descendants of Reverend Ole Jørgen Sadolin (1826-1908), who was the Vicar there in the years 1865-1880, and his beloved wife, Louise Suzette Emilie Sadolin - born Marcussen - (1838-1906).Among family, friends and relatives they was just called "O.I." and"Lulu". Both came from older Danish patrician families. Ole Jørgen came from family of priests, the Sadolin lineage (danish), and had ancestors to lineages such as Brøchner, Friis and Lindemann, while Lulu came from a family of manor-owners, Marcussen (danish), and she also had ancestors to the Hamburg-line of Clan MacGregor as well as the lineages Holst og Saabye. Together Ole Jørgen and Lulu got eight children; five sons, who all got married and had children, and three daughters, and this made the foundation for large number of descendants (danish). Through their children's childhood, Valløby Præstegaard, was it was named then, was visited often by both close and distant relatives as well as friends, which the photo archive confirms. When the children was grown, three of them lived in Copenhagen, one in Nykøbing Falster and one in Fredericia, but they all misses a placed out the city/towns where they could have vacation together. A year after the reverends death the sons, who was informed that their childhood home was put up for sale, bought their childhood home, so that the vicarage in the future could be used as a focus place for their now large family and many relatives. The brother in middle, Gunnar, who was an artistically painter, had together with his fiancé, Esther Margrethe Schultz, in 1906 established Sadolins Farver (Sadolin Paints - from 1912: A/S Sadolin & Holmblad), and the other brothers had - together with a close friend, Olaf Høgsbro, in 1907 made a company with their own savings (total capital DKK 300). In 1909 the company became a limited company (A/S) - and the same the shareholder group was expanded, and now included - among others - Alexander Foss and Gustav Hage, and at the same the shareholders received their first dividend. For this dividend the brothers purchased their own childhood home back, and because of the large dividend from the company they could pay cash - without obtaining loans - for the vicarage. The brothers purchase of the vicarage was by the way inspired by the so called FLS-families; Foss, Larsen and Smidth; who some years earlier had gathered their families at Salten Langsø - close to Them. The brothers had visit these families several times, because the sisters-in-law Esther Sadolin (neé Schultz) - married to Gunnar Asgeir Sadolin, through her fathers sister, and Ingeborg Sadolin (neé Prytz) - married to Knud Sadolin, through her fathers grand-cousin, both had common ancestors with the children of Alexander Foss. Because the Vallø parish had constructed a new vicarage, the name was added "gamle", which stands for "old". Since 1929 the old vicrage has been owned legally by a limited company - founded by the five brothers, which has the same name (Valløby gamle Præstegaard, A/S). The limited company is still owned by the descendants as well as by "The Rev. O.J. Sadolin & Wife Louise born Marcussen´s Memorial Foundation", who is the majority owner and which also was set-up by the five brothers, and which among its articles has the purpose of securing the ownership of the vicarage. The Board of Directors of the limited company consist of one member from of the five brothers branches. The Chairman is elected by the Board itself. The Board of Management consists of one non-employed General Manager, and among the other "staff" is also a Treasurer and two Attendants (a couple) who all are non-employed. All building and garden maintenance work are carried out voluntarily by the family members, and so is the work regarding genealogical studies and internet set-up and maintenance. So the limited family company has no wage employees. With their purchase of the old vicarage the brothers made sure, that their descendants got a beautiful please for common use, such as family parties and holidays. Beside this, more traditional ceremonies, such as baptism, weddings and funerals are also hold here, and for this reason there is often placed tents in large garden. 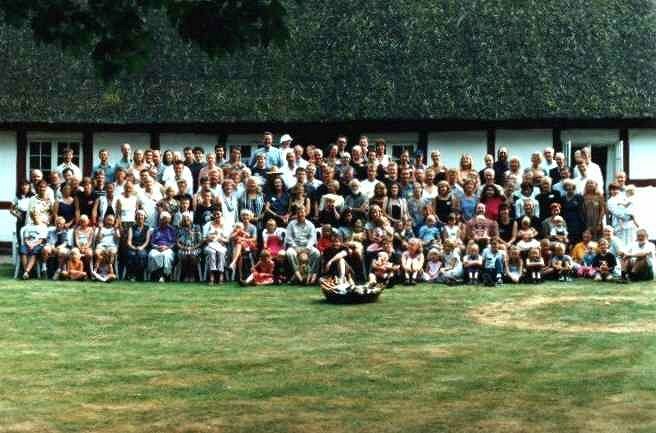 Since 1984 there have a large party every fifth year for the entire family, and through the last summers there have been arranged a family week, where branches and generations - a cross - have had holidays together. The next descendants party will be hold in the summer of 2004, where the vicarage have been the common land estate for the family in 95 years. For information, please visit the main website.